Well, it's actually $36,200 with delivery. 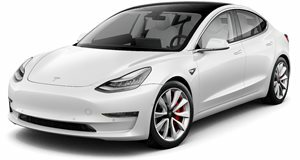 After years of waiting, promises on Twitter, and preorders canceled, Tesla has finally fulfilled its promise to sell a Model 3 for $35,000 (well, $36,200 when you factor in the delivery fee). So now it is our job to explain what you get for your $35,000 and why this car may not be exactly what everyone was dreaming for. We don't want to minimize Tesla's achievement here but the base Model 3 certainly isn't what we'd call luxurious. The Standard Range Model 3 boasts a healthy 220-mile range (as-promised) with a single motor sending power to the rear wheels. 0-60 mph takes 5.3 seconds, which is pretty quick, and the top speed is 130 mph. There's also a new Standard Range Plus model that, for $2,000 more, provides an additional 20 miles of range and a 140 mph top speed. Of course, these prices aren't completely accurate because you can still qualify for a $3,750 tax incentive. Don't be fooled by the prices on Tesla's website because they factor in six years worth of gas savings. With destination included, you should expect to pay $32,450 for a Model 3 with no options. Now that the basic information is out of the way, we have to mention what you don't get on the base car. When we drove the Model 3 (with a $49,000 price tag), it had the Premium Interior. The Standard Interior seems pretty basic with manual cloth seats, basic audio, standard maps and navigation, and an uncovered center console with four USB ports. If you opt for the Standard Range Plus model, you can get the Partial Premium Interior with 12-way power adjustable heated front seats wrapped in a premium material, upgraded audio, LED fog lights, and a customizable center console with storage, four USB ports, and docking for two smartphones. The Premium Interior adds rear heated seats, a 14-speaker premium audio system, internet music streaming, internet browser, and an automatic garage door opener. It is also worth noting the Standard Range car is only available in black at no cost - all other colors cost between $1,500 and $2,000. For those who want Tesla's Autopilot semi-autonomous driving features, those cost an additional $3,000. If this all sounds good to you, the Standard Range Model 3 can now be ordered online with deliveries starting in two to four weeks.